In observance of Thanksgiving we will be CLOSED on Thursday 11/22 and Friday 11/23. Regular office hours will resume on Saturday 11/24. Happy Thanksgiving!!! Excellent visual clarity for close-up tasks with an optimal depth of field up to 5 f t.
Excellent visual clarity for close-up tasks with an optimal depth of field up to 10 f t.
Sharp Focus for Dynamic Workers! Shamir WorkSpace™ and Shamir Computer™ lens is the best lens when focus is needed for both mid-distance and near viewing. Working on near tasks and interacting with people or objects? Then the WorkSpace or Computer lens is the ideal lens. This advanced and highly sophisticated Freeform® lens design is perfect for you if you need a lens that allows you crisp, clear near vision within the workspace as well as sharp focus on people and objects across the room up to 10 feet. The lenses that effectively alleviates Computer Vision Syndrome (CVS)! 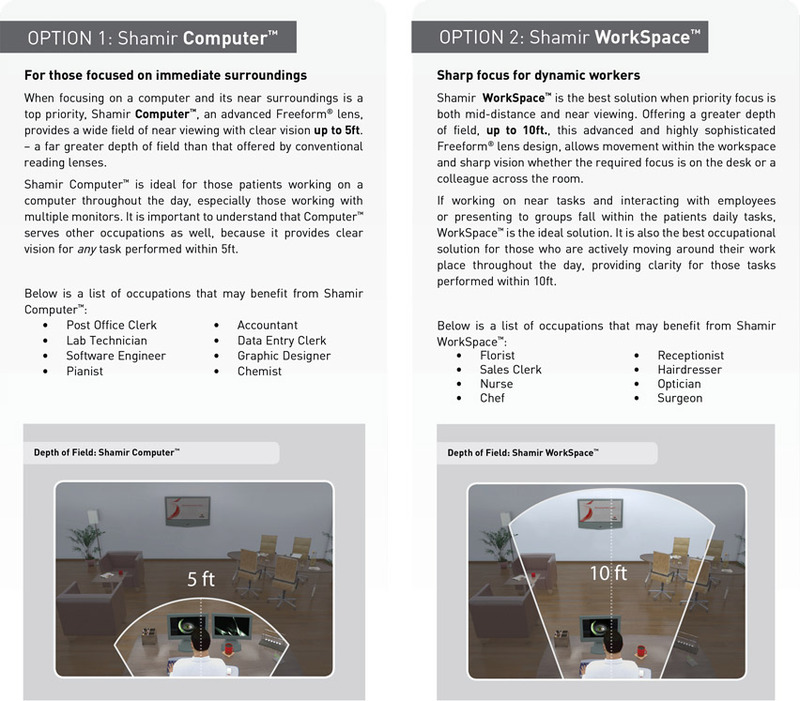 The Shamir WorkSpace and Computer Lens is ideal for focus on close working environments by offering the perfrct cunstomized solutiion whether you need to concentrate on close work on the computer while keeping near surroundings precisely in focus, or wokrs at the compojuter while also focusing on mid-distance workspace. Now with two options Shamir Computer™ and Shamir WorkSpace™, it is easier than ever before to get the perfect solution for you. Niles, Park Ridge, Glenview, Northbrook, Des Plaines, Mt. Prospect, Arlington Heights and Deerfield.